There’s a lot here that’s recognizable from Window OS variants running all the way back to 95, but as with many of the other standard Windows features, 10 has taken an old horse and coded an array of new tricks stashed in its toolkit. Folder options may not have received the sexiest facelift out of everything we’ve seen in 10, but there are still enough new tweaks to talk about that a new user to the OS may not immediately recognize right off the bat. To configure your Folder Options in Windows 10, you’ll need to begin by opening up a window in File Explorer. This can be done by clicking on your computer, or just pulling open the Documents tab from the Start menu. Once here, click in the top left hand “File” menu, and select “Change folder and search options”. You can also get to the same window by going through the Control Panel via the Appearance and Personalization section. Once open, you’ll see the “General” tab as the first section you can make changes to. Here is where you can set features like whether each folder opens in a new window or stays in the same one, or how many clicks are required to launch a file (this can be especially helpful for people with arthritis or carpal tunnel and need to take it easy on their hands). 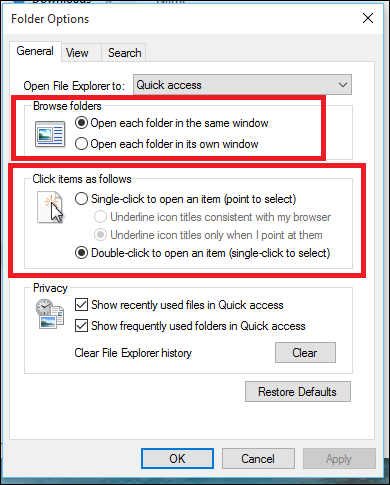 Users can also control how much privacy they have on their account, opting to either display their recent folders in the sidebar or keep them hidden after File Explorer is closed each time. This is the section where you’re going to find the real meat and potatoes of the options you can shift around in your folders. All the old standards are here like the option to either show or hide vital system files, change how icons are displayed, or whether or not folder windows themselves launch individually as their own independent system processes. 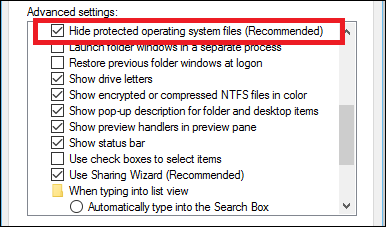 Unless you know you’re specifically looking for a system file that has been bugged or needs to be scanned by an antivirus program, it’s not recommended to keep this unchecked as many viruses will attempt to do a surface-level search for them when attempting to exploit an unprotected machine. 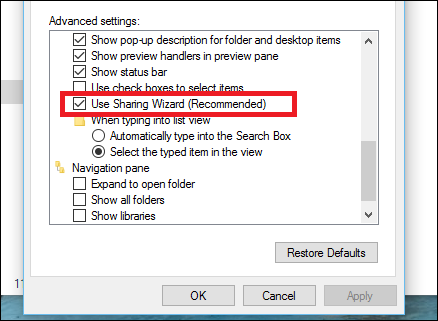 Some new features fresh with the introduction of Windows 10 include the option to use the included Sharing Wizard, and configuring which folders or libraries will appear in the File Explorer’s sidebar. 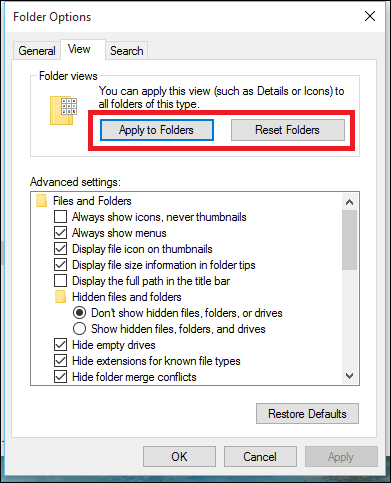 Be aware that whichever folder you opened the Options panel from is the only folder that will have these rules applied to it. unless you click the “Apply to Folders” button in the View panel. Check out our guide to customizing Windows’ folder view settings for lots more. 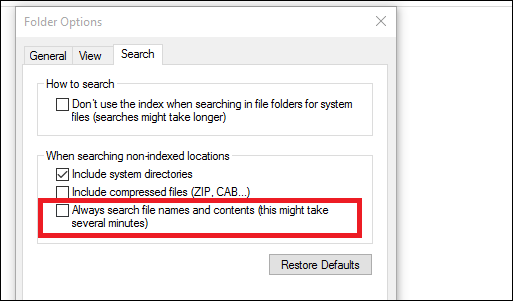 Another box you might want to check if you’re tired of seeing Windows go digging and come up empty handed is to “Always search file names and contents” with every search. This can add a considerable amount of time it takes to find a given file each time you punch in a new scavenger hunt for it to go on, but if you bury things in unknown places or just prefer to keep them as organized as possible, this should be kept on at all times. Windows 10 does a good job of both making changes where they needed to be made, while also not letting the new brand drive them to fix anything that wasn’t broken in the first place. Folder Options is a solid, reliable tool you can use to customize how your files are displayed, what your system can see, and how internal searches are processed.